I heard Spike Trotman note a few years back that one of the challenges in trying to get a syndicated newspaper strip is that your competition is NOT the hundreds or thousands of other artists trying to do the same thing; your competition is reruns of a strip by a cartoonist who already died. 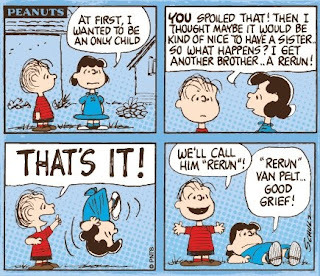 This was maybe a year or so after Charles Schultz died and Peanuts was still being run, so it was something of an obvious analogy. But it occurs to me that there are a couple other different ways to look at her comment. If you focus on the "dead cartoonist" part of her comment, you could interpret her statement to mean that many newspaper comics were created by creators who have since died and were taken over by others. Legacy strips that are wholly owned by the syndicates, who hire new creators to regurgitate the same types of stories and gags over and over. Blondie, The Phantom, Andy Capp, Mary Worth, Heathcliff, Alley Oop... The list goes on and on. That's not a commentary on the quality of the strips either past or present, but keeping a strip going beyond a creator's lifetime means that there's no room for an entirely new creation to take its place. You could focus on the "rerun" part of her comment. Calvin & Hobbes, of course, had been in reruns for years by that point. I think Boondocks as well. If I recall the timing correctly, Lynn Johnston had recently reworked For Better or Worse so that it was largely old material; she hadn't retired yet, but her strip was no longer all new material. I think Foxtrot had by then gone to a Sunday-only format, and the weekdays were replaced with Foxtrot Classics. Since then, the situation has been exacerbated. Get Fuzzy is now largely reruns. Doonesbury is Sunday-only with reruns during the week. You can find "Classics" versions of Garfield, Dilbert, Luann, Nancy, The Norm, Wizard of Id, Stone Soup... We've also lost in recent years Tom Wilson Sr., Stan Lynde, Bill Keane, Jack Elrod, and, most recently, Richard Thompson. And yet you can still find Ziggy, Mark Trail, Family Circus, and the rest still in newspapers. This is just off the top of my head, and there's enough here to fill an entire newspaper page with comics! At some level, I get it. Obviously, the syndicates have an enormous backlog of material that can be mined for little-to-no extra outlay but still generate a decent income. If readers are willing to keep re-reading the scant few years of Boondocks and Get Fuzzy, they'll surely be willing to re-read old Garfield and Dilbert strips they might not have seen in a couple decades. That's almost a no-brainer, right? Re-packaging old material that's already been paid for to sell once again -- why would a business not want to pursue that notion? Well, the problem, though, is that we're talking about newspapers. Sure, you can throw it online alongside all your new material and it's no big deal, but newspapers have a finite amount of space they can work with. That single page of funnies -- which generates no income for them on its own -- is often all they have to work with. So they can go with a 'standard' set of proven comics that they know people like, and they can even get many of them at a discount if they pick up the "classics" version! Why would a newspaper not want to pursue that option? So with both businesses -- the newspaper and the syndicate -- trying to out-cheap each other, it creates something of a death spiral. Newspapers are trying to cut costs by going on the cheap with the comics, but that means less revenue for the syndicates. And readers will eventually tire of the reruns, and the newspapers will take a hit. Which means they tighten their belt more, meaning still less for the syndicate. Eventually, the newspapers drop a comics section altogether and the syndicate itself is left with no income. That's not necessarily inevitable -- either or both parties could change course -- but, at least looking on from the outside, it looks as if neither are all that interested in breaking out of this negative feedback loop. I'm not seeing any real effort from either to try something that doesn't cannibalize their existing business models in the long run. And while the death of the syndicates might not directly cause the death of newspapers, it certainly wouldn't help matters any. And any syndicates that might outlive the newspapers? Who might they sell to then?